Is it possible to get lumps nearly 2 years after having juvederm voluma in my nasal fold? I had it done over 1.5 years ago and have noticed a lump on one side. I’ve had PDO threads in the lower part of my face (not put where I had filler) and about 8 weeks after the PDO threads I noticed a lump where I’d had filler done? Can I have the filler dissolved even at this late stage? It is hard to connect why the volume would change after having the threads placed unless the threads provoked an inflammatory reaction. Fortunately, you can still dissolve the volume with the appropriate enzyme even after two years, if necessary. Juvederm injections changed my smile and have made my face look swollen, what can I do? I had my doctor inject Juvederm into my nasal fold. Two weeks later, my face looks swollen and my smile has changed. One side particularly looks lumpy. What can I do to fix this? After Juvederm injections do I need to massage the area to make lumps go away? I just had injections yesterday and now have large lumpy area next to smile lines, I thought the filler was injected in lines not tissue around it. Does this go away or does it need to be massaged into wrinkle area? How long will my bruising last after getting Juvederm injections? What will the approximate healing time be? Will dissolving Juvederm injections completely remove all noticable unwanted volume? I had Juvederm Voluma injections done yesterday. I am extremely unhappy with the results. Most of the product was concentrated in my cheek area, and when I smile my cheecks are abnormally fat and my eyes look more hollow than ever. How long does it take for Juvederm to dissolve? I got Juvederm injections above my lip and around my smile lines 4 days ago. My lips are still swollen and I can hardly open my mouth or smile. How long does it take for Juvederm to dissolve? What is the average number of syringes used in a juvederm treatment? What is the average number of syringes used in a juvederm treatment? If only filling marionette lines will you need more than 1 syringe of juvederm? My lips feel lumpy after having Juvederm injections, will they smooth out in a few days? I had Juvederm filler placed in my lip 3 days ago. There was some bleeding and a fair amount of bruising. It is getting better, but my lips still feel lumpy. Will that smooth out in a few days or not? Should I contact my provider? Is it safe to massage the area after a dermal filler injection? Does it become more swollen if the area is massaged after the injection? I am getting a lot of comments about how swollen my face is after the filler injections and I thought that would help. Is it normal to have a joker-looking smile after Juvederm? Today I got Juvederm injections to address my marionette lines. Now, I look like I have cotton balls in my mouth and have a joker-looking smile. Is this normal? Can I diminish the effects of Juvederm? I am unhappy with my Juvederm lipnose line filler done 2 mos ago. Now my face is puffy & upper lip is duck-like. I'd prefer not to undergo another needle. Can I do anything at home to lessen the effect or shorten the life of the product? 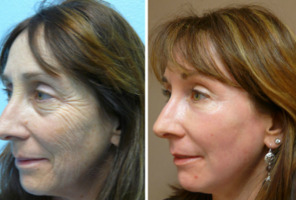 How long does a Juvederm treatment last? Will I need to repeat the treatments frequently? After having Juvederm injections, I developed two large lumps below my tear trough. Is Juvederm to blame? I had Juvederm injections three months ago. Since then I have developed two large lumps below my tear trough.They are 1/2 inch in diameter. There is also swelling near my eyes and cheeks. The person who injected me does not believe it is associated with Juvederm, but my general practitioner does. What are your thoughts? Is it normal to have acne breakouts after Juvederm injections? I had juvederm lip injections about three months ago and since then I've experienced lots of breakouts around my mouth. They seemed to start a few weeks after I 1st got my injections. Has anyone heard of this happening before? Can I use makeup right after a Juvederm procedure to mask redness and bruising? How do I dissolve my Voluma injections? What does the process entail? I had 2 syringes of Voluma 4 weeks ago & don't like the results. I want to have the filler dissolved. What does the the process entail? Will the Voluma all dissolve, or will my face continue to appear uneven? Also, how long does it take for it to dissolve after injection? My lower lip is too big after hyaluronic acid injection, should I use a warm compress to reduce the swelling and size? I had my lips injected with hyaluronic acid, but my lower one is too big. I don't like it. Is it good to use warm compress on it to reduce the swelling and size of it? Why do I have blisters on my lip after juvederm treatment? I got juvederm in my upper lip yesterday and today I have these huge clear blisterlike areas under my lip. They don't hurt and they are not red or irritated. I called my doc and she said to massage it for a week. Why did this happen? Will I be ok? Is there a recommended makeup to cover bruising after Juvederm? I want something that will provide good coverage but not irritate my skin. Too much juvederm was injected. What can be done? Too much juvederm was injected under my eyes what can/should be done? Is this a common side effect of Juvederm? What can be done to treat granulomas if they occur?